We flew to Istanbul in mid-December, when I was six weeks from my due date. We left three months later in mid-March, when Annabelle was 6 weeks old. It was a pretty important stop for us, to say the least. Our first task when we landed was to find a place to live. We’d gotten an AirBnB several weeks prior, but the host cancelled on us two days before we were scheduled to arrive, so we had been scrambling to find a new apartment. Luckily, we found someone that had several apartments right smack in the middle of the oldest and coolest part of the city, and we were able to get one with enough room for us, a baby, and our parents (who were planning to visit around my due date). 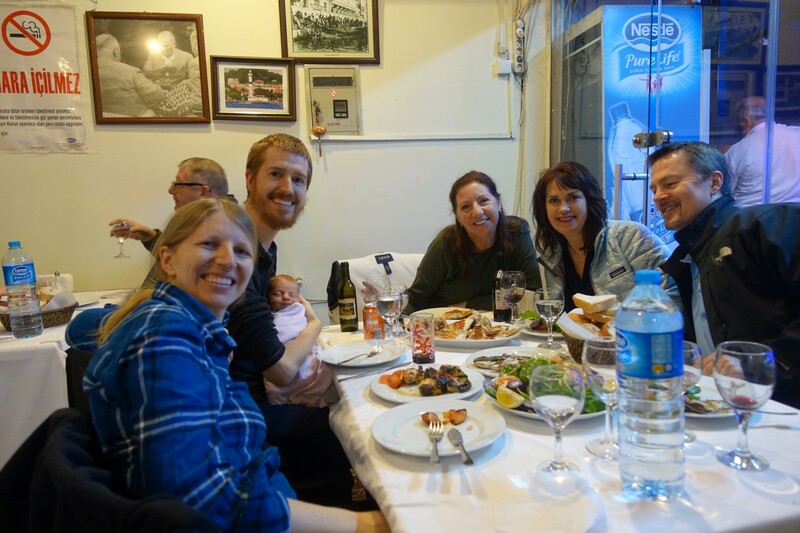 We spent the first six weeks of our time in Istanbul walking around the city, visiting sites like the Blue Mosque and the Grand Bazaar, as well as meeting with our doctor and enjoying the last little bit of time as a couple without kids. Joe and I had our own little Christmas, keeping as many traditions as we could, and then my best friend Blair flew over to celebrate the New Year with us, tromping out in the snow (SNOW! In Istanbul! Who knew it could snow in Istanbul?) down to the Sea of Marmara where we could watch fireworks over the Hagia Sophia. Then some other friends that we had stayed with in London came and visited us for a week, and we had a good time exploring parts of the city with them, though we did experience a nearby suicide bombing that shook me up a little (read Joe’s perspective on it here). 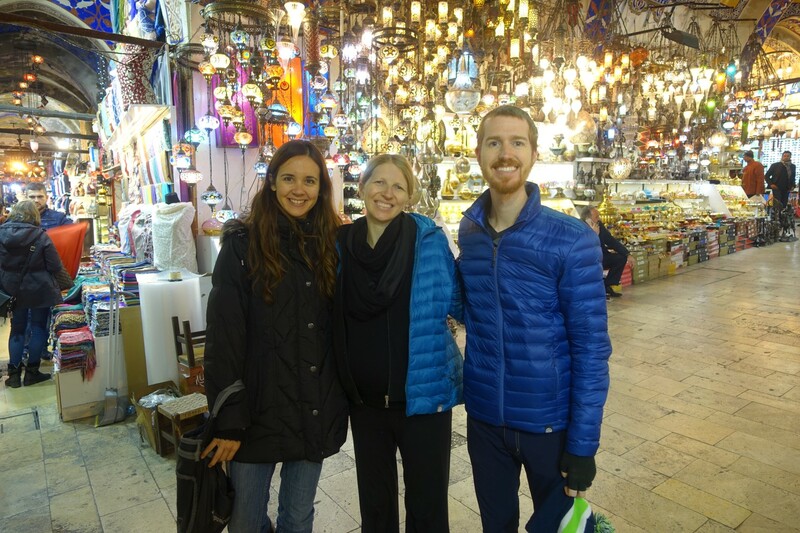 Visiting the Grand Bazaar with a friend. My mom flew in to help us prepare for our baby to be born at the end of January. It turned out that we had less time to prepare than we thought, as I was admitted to the hospital the next evening and Annabelle was born just two hours after I was admitted (you can read more about the birth story here). All of the baby clothes my mom had brought were still wet from washing, and Anna had to spend her first several hours of life wrapped up in a towel. Eventually we made it back to our apartment with a fully-clothed baby, and we spent early February being cared for by our parents while we figured out how to be parents ourselves. I’ll never be able to thank them enough for flying to Istanbul to make us food and help us learn what to do with the tiny alien that had come out of my body. Enjoying a delicious dinner out with family. Istanbul was a beautiful city, and I’m so glad we had the time to wander the streets and experience the city before the new problems that have arisen in Turkey. 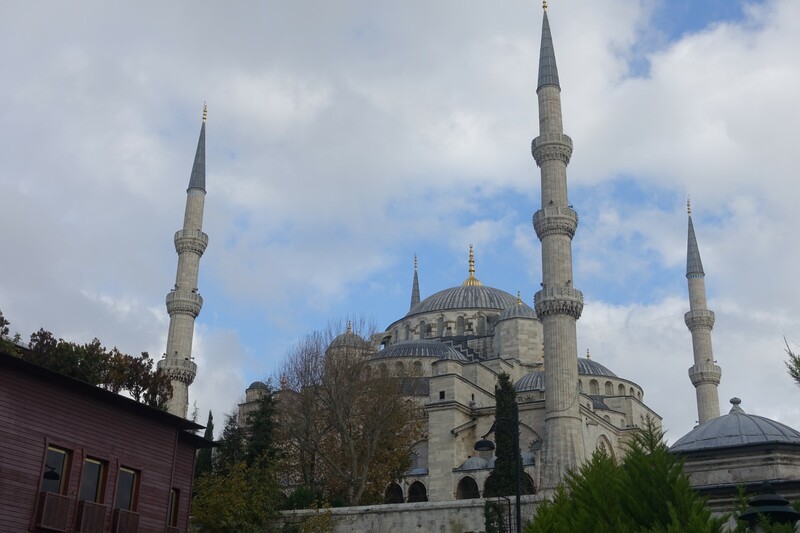 From Roman ruins to Christian churches to Islamic mosques, it’s a breathtaking place. We really enjoyed our time there, and the combination of interesting sights, low prices, and good modern medical care made it a great place to have a baby. I hope we get to bring Annabelle back there someday and show her where she spent the first few weeks of her life.